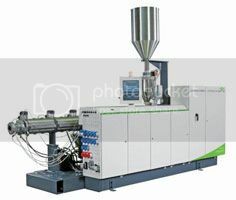 At Chinaplas 2013, Austrian firm Battenfeld-Cincinnati will show its energy-efficient single screw extruder solEX 60 and a conEX 72 from the new series of conical twin screw extruders for pipe extrusion applications. The extruder series solEX is designed for PE-HD and PP pipe extrusion, offering throughputs with small diameters that were previously reserved for much larger machines. This is a significant advantage in terms of space requirements for processors, says the firm. With optimised screw geometries and a large processing length of 40 L/D, solEX extruders offer improved melt homogeneity with low energy input and feature high throughput figures in relation to capital investment. The extruders offer outputs from 300 to 2,200 kg/hour in smooth pipe extrusion and from 240 to 1,800 kg/hour in corrugated pipe extrusion. Another highlight at the exhibition will the conEX 72 from the conEX series of conical twin screw extruders, in response to energy efficiency demands from processors. Battenfeld says that Wuhu Conch Profiles and Science Ltd. (Anhui/China) installed 24 extruders for expanding its PVC processing capacities in 2012. 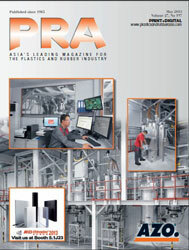 "By using conEX extruders for profile production, substantial cost and material savings can be realised. Especially in times of rising raw material costs, this is very important. Compared to the previous conical twin screw extruders, the conEX extruder has a wider processing window," says Battenfeld. Other benefits are the modest space requirements and optimal processing for a great variety of compounds. Outputs range from 20 to 270 kg/hour for PVC profiles and from 30 to 500 kg/hour for PVC pipe.